You are here: Home / Healthy Diet / Health Supplements, Vitamins & Minerals / Vitamins For Stress Relief And Anxiety: Which One to Take? Who needs vitamins? You get all the nutrition you need, RIGHT? You get plenty from all of the three most important food groups; fats, sugars, and preservatives. So why do you need to bother with vitamin supplements? Well, all kidding aside, we all know that none of our diets are perfect. I would imagine that not all of us are getting the nine servings of fruits and vegetables that are now recommended for us to have. If you are, good! If you’re not, well, you’re like most of us. We mean well, but just aren’t getting the amount of nutrients that we need for our best health. Plain and simple, vitamins are necessary to your health, well-being, AND stress relief. You need sufficient nutrients to help your body perform practically ALL of its functions. It’s also important to select your vitamins based on your specific needs. If you’re physically active, going through extra stress or other changes such as menstruation, menopause, or simply getting older your body needs more of certain nutrients. Having the proper balance of nutrients is extremely important as well. Did you know that a deficiency or an excess of a particular vitamin can cause health problems? For example, the lack of D is the cause of a disorder known as Rickets, a nasty little ailment that can result in bone abnormalities. Scurvy was a disorder caused by a lack of C. You may remember reading about it in history when you were in school. Sailors over long voyages would often come down with it because they had no veggies or fruits with that essential nutrient. 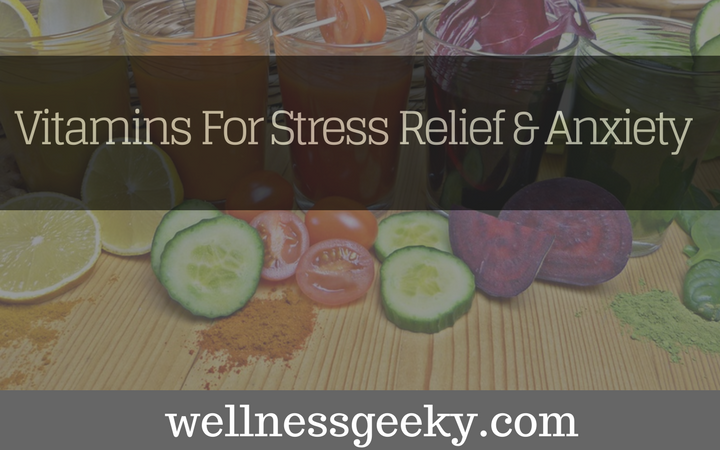 Vitamins can help with stress relief, and your energy levels. Proper amounts of sleep, a good diet, exercise, and vitamins all work together to keep you healthy and happy. Its just common sense to give your body what it needs to do its best. For a basic overview, some vitamins are water soluble and some are fat soluble. Water soluble (c, b-complex) must be taken daily since they are not stored within the body. Fat soluble (a, d, e, and k) are stored in the body. Vitamin A: Helps your immune system, skin and eyes. It’s important in the formation of bones and teeth, and helps protect against colds and flu. As an antioxidant it helps protect the cells against cancer and other diseases. A deficiency can cause dry hair or skin, poor growth, night blindness, and insomnia and fatigue. Taking excessive amounts over long periods of time can be toxic. Good food sources are liver, fish liver oils, green and yellow fruits and vegetables such as apricots, asparagus, broccoli, carrots, cantaloupe, garlic, peaches, pumpkin, sweet potatoes, watercress, and yellow squash. Vitamin B complex: These seem to be able to help in depression and stress relief. You should take the “B’s” together for best results, but I will discuss each separately to give you a more rounded view of them. Thiamine (B1) helps with circulation, digestion and brain function. It helps with energy and proper growth. Riboflavin (B2) is necessary for the development of red blood cells. Niacin (B3) is helpful for circulation, skin, and the nervous system. Pantothenic Acid (B5) is thought to aid in relieving stress, helps to convert fat into energy. Pyridoxine (B6) is needed for normal brain function and cell growth. It also helps the formation of red blood cells. B12 is good for preventing anemia since it helps your body make the most of iron. Folic acid is important for pregnant women as is has been found useful in preventing some types of birth defects. The B’s can be found in beef, brown rice, brewers yeast, eggs, fish, legumes, liver, milk products, peanuts, peas, pork, poultry, rice bran, wheat germ, and whole grains. Vitamin C is a valuable antioxidant. It is important for tissue growth and repair. It’s also good for combating the effects of stress. It works well with E to strengthen your immune system. You can find it in berries, citrus (oranges and lemons), dandelion leaves, and green veggies. Vitamin D is needed for the absorption of calcium. It is needed for normal growth and for normal blood clotting. Good sources are dairy products, eggs, dandelion greens, liver, oatmeal, salmon, sardines, and tuna. Vitamin E is an important antioxidant that works well with C. It is thought to help in preventing cancer, is good for repairing tissues, and also helps keep your nerves and muscles healthy. It can be found in vegetable oils, dark green veggies, eggs, flax seed, nuts, seeds and whole grains. Vitamin K is good for proper blood clotting, in bone formation and repair. You can find it in asparagus, broccoli, cabbage, liver, oatmeal and soybeans. That’s a basic rundown of some important vitamins. Hopefully, by now you’ve realized that they are fairly important for your health, and in stress relief. So, how do you know which vitamins you need? It’s difficult to know just what vitamins and in what amounts you need in different times of your life. We can sit down and study and figure out the exact amounts, but most of us simply don’t have the time. I’ve spent countless hours studying health, nutrition, and stress relief and there’s always something new to learn. A resource such as LifeScript vitamins is helpful because that’s what they do. You can take their nutrition profile by answering a few simple questions about your current lifestyle, health, and habits and they give you recommendations tailored to your specific needs. I consider myself to be fairly savvy when it comes to health issues, so I took their profile to see what they’d recommend for me. I have to admit I was satisfied and I agreed with their suggestions. Considering my age (alas) they recommended supplements with increased calcium and special nutrients geared to my approaching life changes. If you’re looking for some good articles on nutrition, they have those as well as some yummy recipes. Final Note: Remember when your Mom told you to take your vitamins (eat your vegetables, or drink your milk)? Smart woman; she knew what she was talking about. Listen to your mother, eat healthily, get enough sleep, and exercise. Your body and mind will be glad you did. You’ll find you will be able to handle stress better as well.